Habit: Annual, perennial herb, shrub, vine. Leaf: simple or compound, cauline (or most basal), alternate or opposite; stipules 0. Inflorescence: cymes, heads, clusters, or flower 1; bracts in involucres or not. Flower: sepals generally 5, fused at base, translucent membrane generally connecting lobes, torn by fruit; corolla generally 5-lobed, radial or bilateral, salverform to bell-shaped, throat often well defined; stamens generally 5, epipetalous, attached at >= 1 level, filaments of >= 1 length, pollen white, yellow, blue, or red; ovary superior, chambers generally 3, style 1, stigmas generally 3. Fruit: capsule. Seed: 1--many, when wetted swelling or not, gelatinous or not. Genera In Family: 26 genera, 314 species: America, northern Europe, northern Asia; some cultivated (Cantua, Cobaea (cup-and-saucer vine), Collomia, Gilia, Ipomopsis, Linanthus, Phlox). Note: Leptodactylon moved to Linanthus. Scientific Editor: Robert Patterson, Thomas J. Rosatti. Habit: Annual, perennial herb. Stem: generally erect, generally branched from base. Leaf: cauline, opposite, entire or lobes 3--9, palmate, linear to narrowly lanceolate or spoon-shaped, generally not fused by membrane. Inflorescence: head, open clusters, few-flowered cyme, or flower 1; bracts +- leaf-like, generally palmate-lobed, lobes generally not connected by translucent membrane; flowers sessile or not. Flower: sepals generally equal; corolla funnel-shaped, salverform, or bell-shaped, with hairy ring inside tube or generally not (determined at 10×); stamens attached at 1 level, pollen yellow. Species In Genus: 30 species: western North America, Chile. Etymology: (Greek: narrow tube, for corollas of some species) Note: Calyx lobe membrane generally expressed as length relative to calyx or lobe length, or as width relative to calyx lobe. Habit: Perennial herb, hairy. Stem: many, 10--20 cm. Leaf: lobes generally 5, generally linear. Inflorescence: clusters. Flower: calyx 8--9 mm, membrane generally obscure, generally much narrower than lobes; corolla funnel-shaped, tube <= calyx, white or light yellow, throat yellow, lobes 4--5 mm, white; stamens included or +- exserted; stigmas +- exserted. Seed: < 2 mm. Chromosomes: 2n=18. 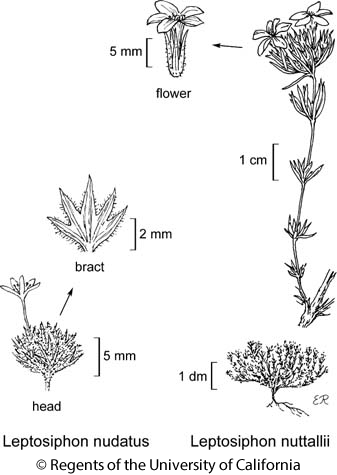 Citation for this treatment: Robert Patterson & Robyn Battaglia 2012, Leptosiphon nuttallii, in Jepson Flora Project (eds.) Jepson eFlora, http://ucjeps.berkeley.edu/eflora/eflora_display.php?tid=80369, accessed on April 19, 2019. Markers link to CCH specimen records. Yellow markers indicate records that may provide evidence for eFlora range revision or may have georeferencing or identification issues. Purple markers indicate specimens collected from a garden, greenhouse, or other non-wild location.